Addendum (10/24/18; 8:11 AM): A recent review by SGC has reaffirmed that the Authentic designation is due to adhesive along the bottom edge of the photo. Additionally further review shows a small embossed "Rand" of unknown origin is visible only under extremely close inspection in the top right corner of the mount and is mentioned strictly for the sake of accuracy. Presented is an extremely rare example of the legendary Joe Jackson from the 1911 T5 Pinkerton Cabinet series. To the best of our knowledge this is one of only three examples known to exist of this extreme rarity. This is a magnificent example of one of the most impressive of all Joe Jackson cards. T5 Pinkerton cabinets are among the rarest of all 1910-era tobacco issues. These cabinet cards were available only by mail in exchange for coupons packaged with cigarettes produced by the Pinkerton Tobacco Co. Each T5 premium card is designed with a real photo (3-3/8 x 5-1/2 inches) affixed to a thick cardboard cabinet-style mount (4-3/4 x 7-3/4 inches). This outstanding example of Joe Jackson #616, in a fielding pose, is bright, fresh, and clean. Usually affixed to the mount only along the top of the photo, we believe that the SGC Authentic designation is likely due to the photo being affixed in additional areas. The card is not altered in any other way. The mount shows very light corner wear (with a little more to the lower right) and the lower left corner of the photo is missing. 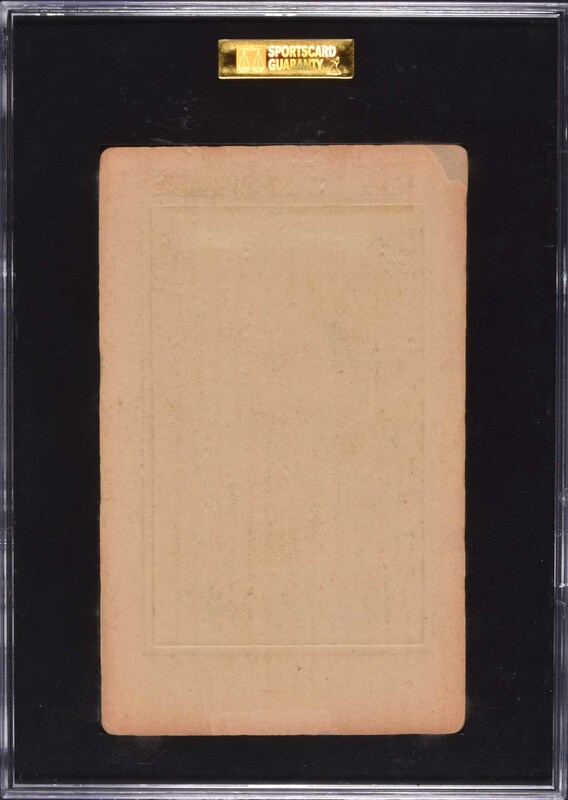 The reverse is clean with just a small area of paper loss on the upper right corner, as well as evidence of a label that was once affixed then neatly removed without impacting the paper stock. T5 Pinkertons are found with two different mount styles: a thick cabinet-card mount with a surrounding embossed decorative imprint and a thin paper mount. The offered example is on the more desirable, higher-quality thick mount. 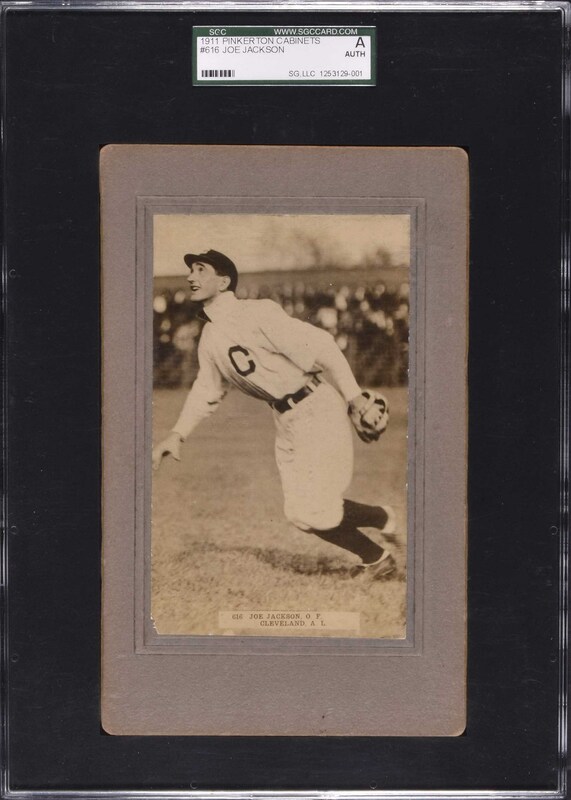 This is an exceptionally attractive example of one of the best of all Joe Jackson cards and would be a significant addition to any serious Black Sox or prewar-card collection. Reserve $10,000. Estimate (open).